People in Cumbria are being reminded that it’s not too late to get a flu vaccination. The recent spell of cold weather can often be an issue for patients with respiratory issues and the flu vaccination is recommended to help ahead of further cold conditions. those aged six months to under 65 years in clinical risk groups including patients who suffer from a chronic illness, such as Chronic Obstructive Pulmonary Disease (COPD), kidney disease, hepatitis, Parkinsons, HIV and diabetes. Dr Helen Horton, Distington GP, said: “It’s not too late and we are still encouraging people to get their flu jab. Even if you had your jab over the last winter period, you will need to have one again, because flu changes every year. Studies have shown that flu vaccinations will help prevent people from getting flu. The flu vaccine is available every year to protect adults, and some children, at risk of flu and its complications. It provides protection against strains of flu that are predicted to circulate each year, as these strains may be different from previous years. Although the vaccine won’t stop all flu viruses and the level of protection may vary from person to person. If you do get flu after vaccination it is likely to be milder and shorter-lived than it otherwise might have been. This year a more effective vaccine is also being given to those aged 65 and over, which is proven to give better protection against flu for people of this age. The newly available ‘adjuvanted’ vaccine is expected to significantly boost effectiveness by improving the body’s immune response to the vaccine. This is important because typically, older adults’ bodies do not respond as well to the flu vaccine due to their naturally weaker immune systems. Older adults are also more likely to suffer complications from flu. For most children the flu vaccine is a quick and easy nasal spray. Children aged 2 and 3 receive the vaccine through their GP and children reception and school years 1, 2, 3, 4 and 5 receive it in school. If you have a child who is of the eligible age, make sure you sign the consent form allowing them to have the flu vaccine at school. The nasal spray may also be available for people with learning disabilities. Dr Horton added: “The option of the nasal vaccination is available for children, ensuring that they are protected with this painless and effective process. “Real flu can be debilitating and if you are already living with a condition, you are either very young or very old it can hit you harder. The cold weather can often cause symptoms of illness, but many of them can be tackled by taking some simple steps and by visiting your local pharmacy. 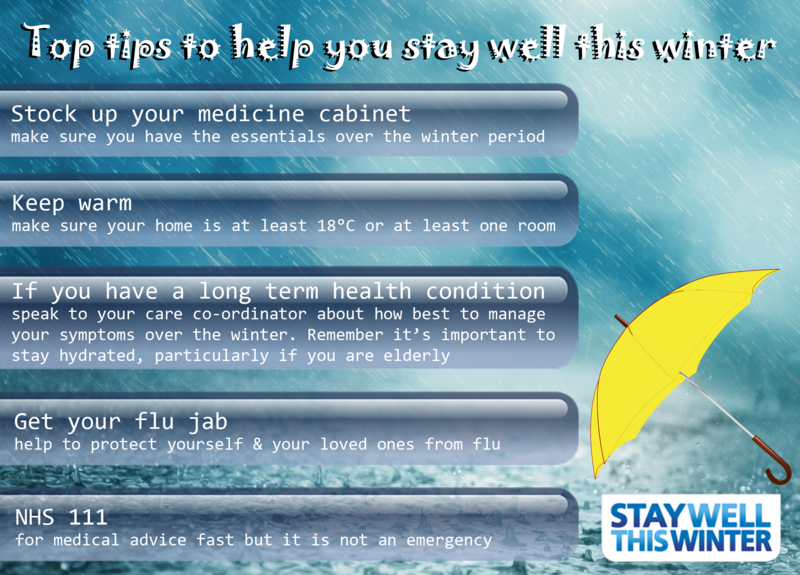 Here are some other simple tips to help you stay well this winter. Keep warm – If you have reduced mobility, are 65 or over, or have a health condition such as heart or lung disease, you should heat your home to at least 18C. If you have elderly relatives please make sure they are drinking plenty of fluids to prevent dehydration. A free child health app is also available to download on your mobile to offer advice for looking after your child’s health. The NHS guide has been specifically designed for parents and carers of children aged 0-5 years. The app was designed by hospital specialists, doctors, health visitors and pharmacists to provide lots of useful hints and tips. Search for ‘NHS Child Health’.